The sister of the Doctor who died of Ebola in Port Harcourt has escaped. It was gathered that the woman escaped to Abia State to avoid being quarantined along with others who came into contact with the late doctor. The good news is that one of her siblings, who is also a Medical Doctor in the city, has forced her to go back to the quarantine center in Port Harcourt, advising her that she could get help there. The woman, whose action would have further endangered the lives of more Nigerians, helped care for her brother, the late Doctor, before it was discovered that he died of the deadly Ebola. 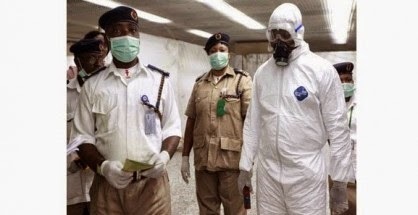 At least 200 people who came in contact with Dr. Enemuo, who died last Friday in Port Harcourt, and most of those who visited his hospital and the hotel where Dr. Iyke Enemuo treated the ECOWAS staff that took the disease to Port Harcourt have been quarantined. The ECOWAS diplomat who had had contact with late Patrick Sawyer flew to Port Harcourt the same day he died, and met up with Dr. Enemuo. Possibly aware of the deadly nature of the disease the diplomat was suffering from, Dr. Enemuo opted to treat him secretly at a local hotel. After recovering, the ECOWAS staff flew back to Lagos to seek clearance to travel out of Nigeria. Quarantined and checked for Ebola in Lagos, he was found to be free of the virus. However, a few days after he left Port Harcourt, Dr. Enemuo took ill and was hospitalized at Good Health Hospital in Port Harcourt where he died of Ebola. The hospital has now been closed down, until further notice.